Someone who doesn’t take the time to recognize Petunia’s full range as a musician would most likely label him as a country act. (It doesn’t help that he rivals Hank Williams in the yodeling department.) 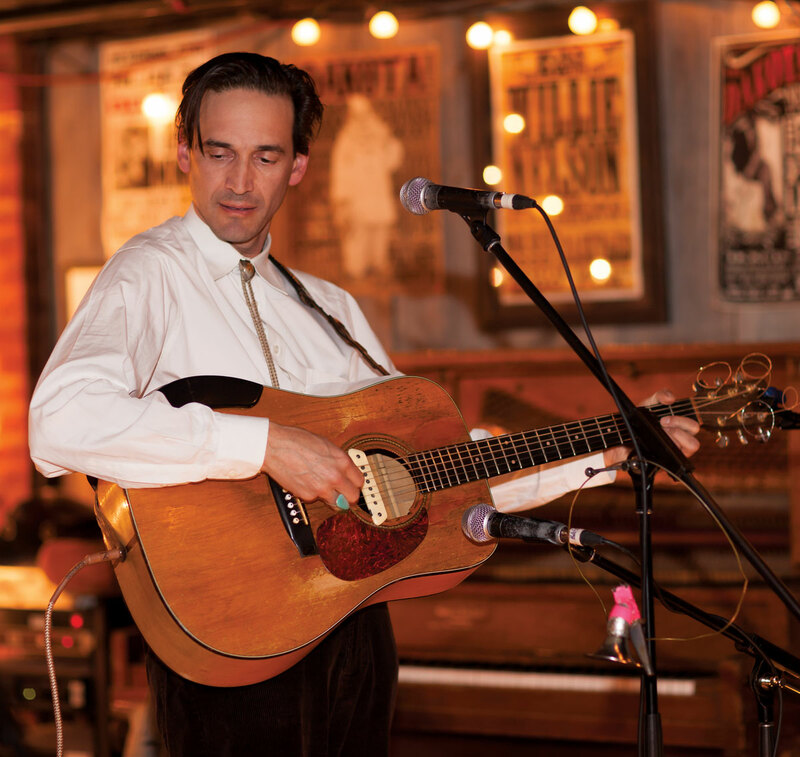 Those who listen a little longer might categorize him as roots, blues, Americana, rockabilly, or jazz, and draw comparisons to Williams, Jimmie Rodgers, Jerry Lee Lewis, or the bar band from a David Lynch film. But those who listen longer still will recognize that while all of these descriptions, and others, are valid, none can define him accurately on their own. In more ways than one, Petunia refuses to be fenced in. Since the age of eighteen, Petunia has been a wandering soul. His mantra is “We only live for a short time. We might as well make the most of it.” As a result, he’s spent much of his life in search of “experiences,” moving from town to town, depending on the kindness of strangers—many of whom quickly become friends. Petunia came to music in a roundabout way. His parents were passive music listeners whose tastes leaned toward Paul Anka and Neil Sedaka—not the type of sounds that make a kid growing up in Laval, Quebec, long to pick up a guitar and sing. He says his earliest, most important influence was the 1976 K-Tel compilation Looney Tunes, which included such novelty songs as Napoleon XIV’s “They’re Coming to Take Me Away, Ha-Haaa!” and “Kookie, Kookie (Lend Me Your Comb),” by Edd “Kookie” Byrnes. Eventually, older cousins played him more groundbreaking artists, like Led Zeppelin, Bowie, Boney M., and AC/DC. His true musical awakening, which he refers to as a “Frankenstein moment,” came while living at the Cineforum, when the comedian Sheila Gostick taught him how to sing and play guitar, and rechristened him Petunia. He started busking soon after, and in a sense has never stopped. When not touring as a solo artist, Petunia is joined by the Vipers, a band formed from the ashes of the rockabilly star Ray Condo’s Ricochets after his death, in 2004. Together, they’ve recorded three albums of originals and less-known covers, most recently Inside of You.